Hospitals, clinics, and other health care providers are just like any other businesses. They need to manage large numbers of employees and control expenses, while delivering needed services. Health care providers are worksites struggling to stay competitive and successful. The most successful ones offer health and wellness programs to their employees. “Healthcare workers have higher-than-average health risks and carry a greater burden of chronic illness. Hospitals that tackle this issue can strengthen their business performance and community service.” ~ Raymond Fabius, MD, chief medical officer for the Healthcare business of Thomson Reuters. Most healthcare professionals take great pride in their work. They often put patients first and make their job a priority over other things, including their personal health. This is admirable, but comes with a price. Hospitals and other healthcare settings are excellent places to offer wellness programs because healthcare workers struggle with their own health. This does not have to happen. Just because a person chooses to work as a healthcare provider doesn’t mean that their personal health should suffer. Every day healthcare workers watch patients experience the pain and suffering that results from poor lifestyle behaviors and unhealthy living. Hospital wellness programs should be implemented in every healthcare setting because healthcare workers have some of the nation’s highest health risks. More than any other profession, healthcare workers are acutely aware of what happens to those who use tobacco, don’t exercise, or become obese. And yet, healthcare professionals have some of the highest rates of elevated health risks among any other professions. 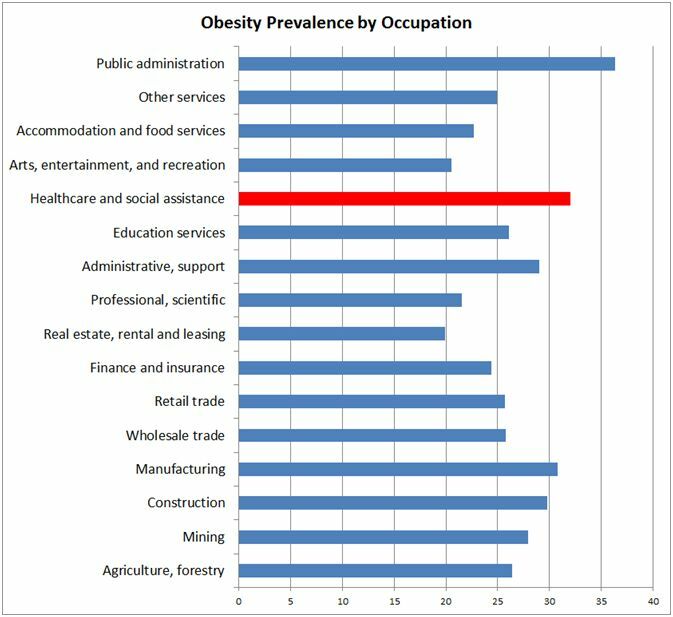 The table below demonstrates the prevalence of obesity among different professions. With the exception of those who work in public administration, healthcare professionals have some of the highest rates of obesity of any other profession. Over 32% of those who work in healthcare are clinically obese. This rate of obesity is higher than just about any other occupation. This data includes only those who have a body mass index greater than 30. A study of hospital workers in Texas showed that 78.1% of healthcare workers are overweight or obese (body mass index [BMI] ≥25.0 kg/m2). Stated another way, 4 out of every 5 healthcare workers in the state of Texas is overweight. These employees had high rates of hypertension, high blood glucose, and high blood cholesterol. It’s pretty clear from the research that those who work in the health care industry have dramatically higher rates of obesity. Why is this so? Why Do Health Care Professionals Struggle with Excessive Weight? When compared to those who are normal weight, overweight healthcare employees eat more starchy foods, fats, and sugary beverages. They spend more time watching television, playing computer games, and sitting than their normal-weight counterparts. Studies that have focused specifically on nurses have shown that those who are struggling with weight are more likely to be involved in shift work and long work hours. They report having to work in a high-stress environment where there is psychological, emotional, and physical demands. Not surprisingly those who are suffering from weight are also more likely to report work-related musculoskeletal injuries and pain. It’s hard to tell which comes first: the work-related injuries or the excessive body weight. It’s clear that healthcare workers have a significantly higher rate of obesity compared to other workers, and high rates of obesity in this group is just the tip of the poor health iceberg. Evidence also suggests that healthcare workers also have very poor diets and fail to get adequate physical activity. It appears that the excessive weight is most likely caused by a combination of factors including high amounts of stress, poor nutrition, and lack of regular physical activity—all behaviors that are directly impacted by a comprehensive wellness program. The connections between lifestyle behaviors, elevated health risks, and chronic disease are all well documented. Employees with elevated health risks are more likely to develop chronic diseases. That is exactly what the research findings show. Health care workers and their dependents are significantly more likely to be diagnosed with depression (20% higher) and asthma (12% higher), including higher admission rates for the treatment of asthma. Looking at over 350,000 healthcare workers, researchers were able to demonstrate significant differences in chronic diseases. Healthcare workers are much more likely to have chronic diseases and struggle with chronic diseases. This fact alone can explain much of the difference in health care costs that are experienced by healthcare workers. As might be expected, healthcare workers who have elevated health risks, like obesity, are more likely to have chronic diseases and subsequent healthcare costs. This is exactly what the research demonstrates. Several large studies looked at the healthcare costs of 1.1 million healthcare workers and compared these to the healthcare costs of 17.8 workers from other occupations. Medical care and prescription drugs costs for healthcare workers are 10% higher than the general employee population and 13% higher when employees’ dependents were included. This dramatic difference in the cost of healthcare is even more troubling when you consider the average age of the typical healthcare professional. Health care workers tend to be younger females with an average age of almost 2 years younger than the average US worker. Despite the fact that younger employees use less healthcare, the cost of medical care for healthcare workers is significantly higher than the cost for other employees. Hospital-based employee wellness programs that focus on reducing elevated health risks have been shown to have a direct impact on the cost of healthcare. 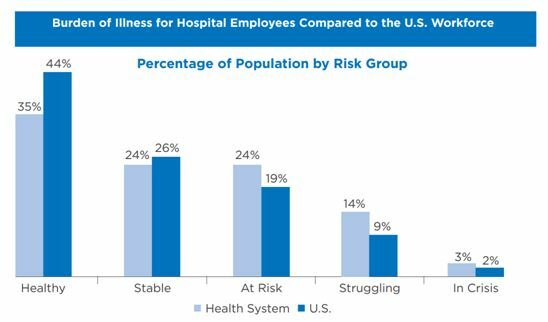 This is one of the most important reasons why worksite wellness programs in hospitals are so important. One study concluded that a health system with 16,000 eligible employees would save $1.5 million annually for each 1 percent reduction in health risk. Lowering health risks is exactly what good wellness programs do. A 1% reduction in health risks is actually very small. 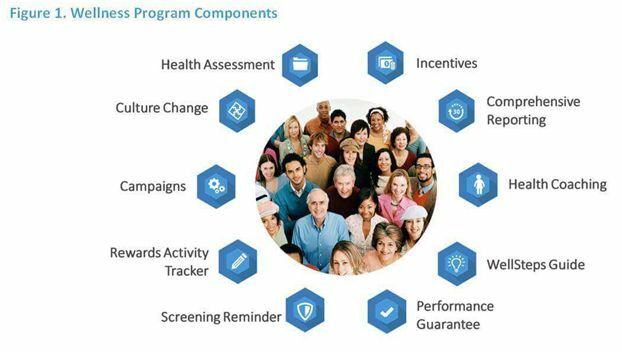 Hospitals that use WellSteps wellness solutions get a performance guarantee that health risks will be reduced by 7% after just two years. Genetically, healthcare workers are pretty much like everybody else. They may be slightly younger, more educated, and may have more females in the population but this alone cannot explain why they are less healthy. The main explanation for the high rates of obesity in healthcare costs has to do with the cultural and environmental factors they face at their places of work. For example, depending on the specific job some healthcare professionals may be sedentary or they may do a lot of on-the-job walking. 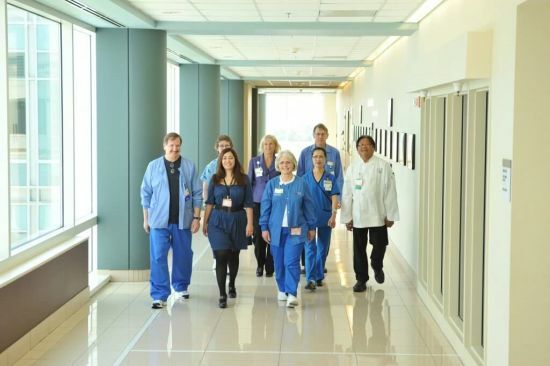 One study found that hospital nurses walked 4–5 miles during a 12-hour shift and 1/3–1/2 mile per hour worked. In many cases this includes a lot of stair climbing. On the other extreme, some healthcare workers are completely sedentary during their entire shift. Nutrition plays perhaps the biggest impact on poor health. Historically, healthcare workers would typically bring their own lunches, which could include sandwiches and some fruit. Today, very few healthcare workers bring their own lunches, preferring to consume foods found in vending machines or in the cafeteria. Another reason for the poor nutrition of healthcare workers is the lack of time available to have a healthy lunch. Rather than sit down at a planned nutritious meal, many workers might just grab a snack or fast food item from a vending machine. Many healthcare workers complain about the amount of stress that they experience in the worksite. It is often believed that high amounts of psychological stress could lead to poor work performance and elevated health risks. It is still unclear whether high amounts of work stress contribute to high rates of obesity. Once again, a well-developed hospital employee wellness program can have a direct impact on employee physical activity, nutrition, and stress. These three risk factors should be the core of most hospital wellness programs. A trip to the emergency room costs an average of $1,233. That’s about 40 percent more than the average American pays for rent ($871 per month). This is a problem for healthcare workers because they and their dependents are 22% more likely to visit the emergency room than other workers. Healthcare workers are hospitalized 5% more than the US average, and they stay in the hospital for 18% more time. During these emergency room and hospital admissions they are more likely to be treated for chronic diseases such as depression, asthma, diabetes, obesity, coronary artery disease, congestive heart failure, hypertension, and back and spine disorders. The reason healthcare workers are more likely to use health care is because they are more familiar with how healthcare works. Many healthcare providers will seek healthcare services for the procedures and conditions they are familiar with. It’s as if familiarity with the business of healthcare increases the odds that they will use that healthcare. In my opinion this is the single biggest reason why healthcare workers have dramatically higher health care costs. They are familiar with the processes and procedures used in the medical community and they don’t hesitate to use them. The best wellness programs are effective at improving employee health and reducing the incidence of chronic diseases. This means program participants have lower use of medications and hospital visits. This translates into lower health care expenses for both the employees and the employers. Not only are hospitals and healthcare settings are likely to offer hospital-based wellness programs for their employees, but they are increasingly more likely to offer the same services to people and their communities. The number of hospitals offering health and wellness programs to people in the community increased from 19% in 2010 to 66% in 2015. The use the WellSteps wellness solutions to improve their health of their own employees and they market these same services to businesses and worksites in their community. 1) Hospitals are offering wellness services in the community as part of their marketing and branding strategies. People see hospitals promoting wellness, and they associate high quality of life and good health with those who use those hospitals. 2) Hospitals are using wellness programs as a revenue generator. They’re doing wellness to make money. Along the way they can build partnerships with worksites and communities; not only are they good at treating disease, they’re making efforts to prevent disease from ever happening. A web-based data platform on which to administer, communicate, and evaluate the program. Few companies do all three. That why the fastest growing segment of the wellness market is the reseller market. Health care provides who want to do wellness for their own employees or for employees in the community will use a wellness software platform. They deliver the wellness program with the right technology without having to develop the technology. In 2015, about 87% of hospitals reported that they were doing at least some health and wellness program or other initiatives for employees. Few of these programs are comprehensive, but at least they are a start. A comprehensive hospital wellness program offers a complete wellness solution. Unlike most worksites, hospitals, clinics, and healthcare facilities are the perfect places to promote the prevention and early detection of chronic diseases. Healthcare facilities are in the business of screening for cancers and giving injections. That’s why the hospital wellness program for employees is the perfect place to offer flu shots. These programs are also ideal for promoting early detection screenings such as mammography, colonoscopy, and other preventative screenings. To get the most out of a wellness program every employee ought to have their blood screened at least once. Healthcare facilities are the perfect places to analyze blood samples because that’s what they do. A wellness program within a hospital setting could easily and affordably offer their employees biometric screenings. Hospitals are the perfect place to screen for elevated blood lipids, glucose, and blood pressure. Screening and gathering blood is actually the easy part. The hard part is convincing people to do something once they have identified elevated health risks. You would think that because hospitals and other healthcare settings are the perfect place for healthcare workers to get screened that many of them would get screened. Surprisingly, that does not appear to be the case. A recent survey showed that health care workers and their dependents are actually not as compliant with common preventative screenings for cancer or for lipids when compared to other workers. A great wellness program for hospitals should take full advantage of all screening resources that are available. They should also do a better job of communicating why employees should get screened. Think of the different benefits employers typically offer. These could include a retirement or pension plan, healthcare, paid time off, or maternity leave. These are designed to help your organization recruit and maintain qualified employees. Yet there are no studies or statistics that show that offering these benefits as any measurable effect on it worksite’s ability to recruit or maintain workers. We do them because we believe they are important. These things are actually very hard to study; while we have a feeling they do make a difference in our ability to attract good workers, there is no science to back any of this up. Now consider your wellness program. Unlike all the other benefits your worksite offers, wellness programs have been studied for decades. There are hundreds and hundreds of rigorous scientific evaluations of the impact of wellness programs. We are blessed to have mountains of workplace wellness statistics. There is more research on the impact of wellness programs than anything else your company does. Granted, the research is not perfect—no research ever is. But after decades of scientists evaluating programs, we have an enormous amount of very solid statistical evidence that show the benefits of having a wellness program.